USD bulls are trying to beat EUR with the US strong economic reports however, it does not seem that they are being successful. 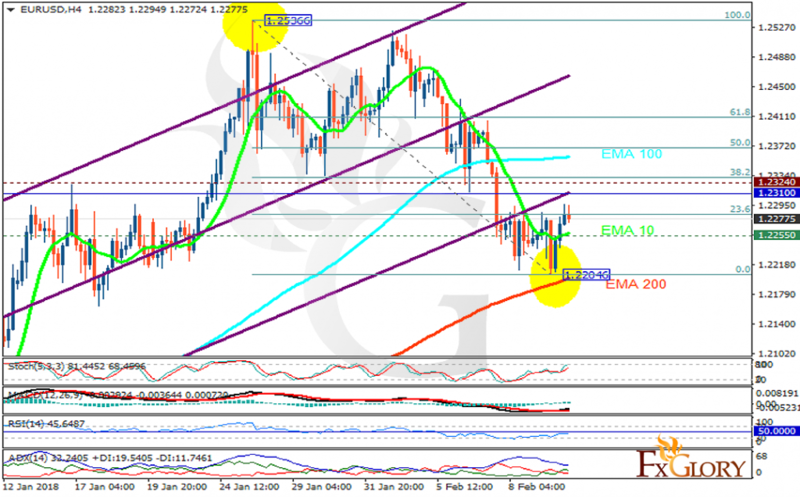 The support rests at 1.22550 with resistance at 1.23240 which the weekly pivot point at 1.23100 is located in between the lines. The EMA of 10 is moving with bullish bias in the ascendant channel and it is above the EMA of 200 and below the EMA of 100. The RSI is moving below the 50 level, the Stochastic is showing upward momentum and the MACD line is above the signal line in the positive territory. The ADX is showing buy signal. The pair is moving slowly towards the 61.8 level of Fibonacci targeting 1.24.